3 bedroom apartment, recently renovated and enjoying superb sea views. 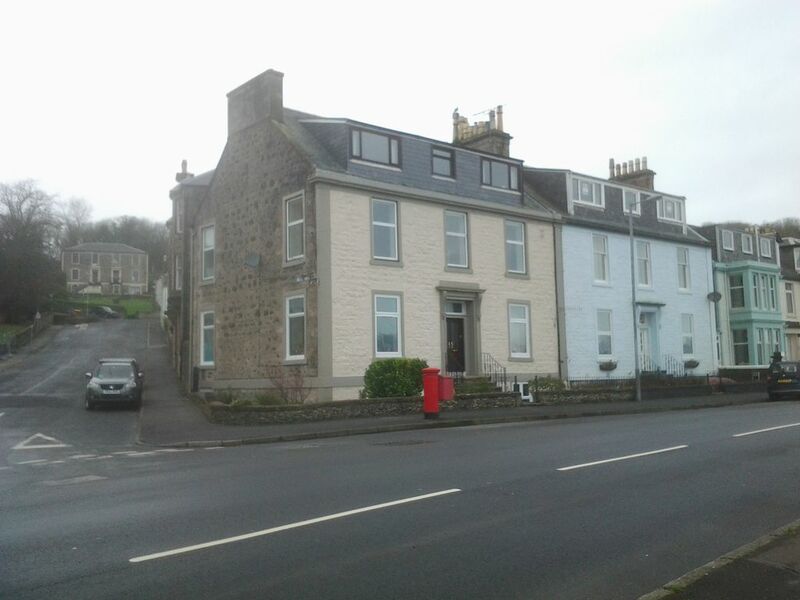 The apartment itself is within a short walk (5 mins) of the main ferry terminal to Ardrossan/ Wemyss Bay and is also close to all amenities that can be found in the town of Rothesay. 2 bedrooms with double bed, the other with bunk beds, which makes it ideal for family getaways, or couples alike. The stunning, professionally designed and installed kitchen is a welcome place to enjoy cooking or a glass of wine after exploring the many things to do on the island. Or you may even prefer to just relax in the beautiful sitting room, enjoying the warmth of the fitted wood-burning stoves. Beds all made on arrival. Guests asked to strip beds on departure so cleaners know what beds have been used. Fitted in kitchen. Large drying green outside.. Feature fireplaces in every room inc. bedrooms. Plenty of on street parking to front and side. BT broadband unlimited use f.o.c. Wood burning stove in kitchen and living room. Bosch 900 watt in kitchen. 54ins smart 3D tv with many apps inc Netflix - BBC I PLAYER - YOU TUBE ETC. Also linked to internet and blue ray Dvd player. 3d glasses supplied. Wonderful seafront apartment with glorious views. What's not to love about this place. Great location around 5 minutes stroll from the ferry terminal. Handy for some excellent local bars and restaurants. The local supermarket was a surprisingly well stocked coop which once I saw the fantastically well appointed kitchen, was my first stop. Three good sized bedrooms, a quaint bathroom (with a great shower! ), and a ballroom sized lounge with plenty of comfortable seating. There was even an honesty bar in case you run out of those "little essentials"! All in all, all of our needs met with comfort and style. Would recommend and will certainly be back. A very sincere thanks to Gordon who clearly takes pride in this place and does all that he can to ensure the best possible visit. We had a great time in Bute, the place was very clean, very well equipped, amazing views, spacious and we loved the wood stoves (even though we didn't light them). Very modern kitchen and the décor felt like home away from home. Gordon was very helpful to us and attentive to anything we may have needed or questions we had. We would definitely rent again without hesitation. The winding staircase to the second floor was a bit of a challenge with large suitcases but it also added to the charm of the building and made you feel like you really were living in Scotland. Many thanks for your review Heather. Bute is an amazing island you need to check it out in the summer!! My husband and I Visited Rothesay for the weekend with our friends for their 30th Wedding Anniversary and stayed in this lovely first floor apartment overlooking the water. The location right next to the Pavilion couldn’t have been better with only a short 10mins walk into the centre and easy access to local pubs and restaurants. We enjoyed numerous early morning walks along the waterfront despite the weather not being great. The interior of the apartment has been decorated to a very high standard was spotlessly clean and has everything you could ever need for a break away from home. Gordon the owner did all the interior work himself and was on hand to answer any questions we had. We lovely every minute of our stay and will definetly be back.